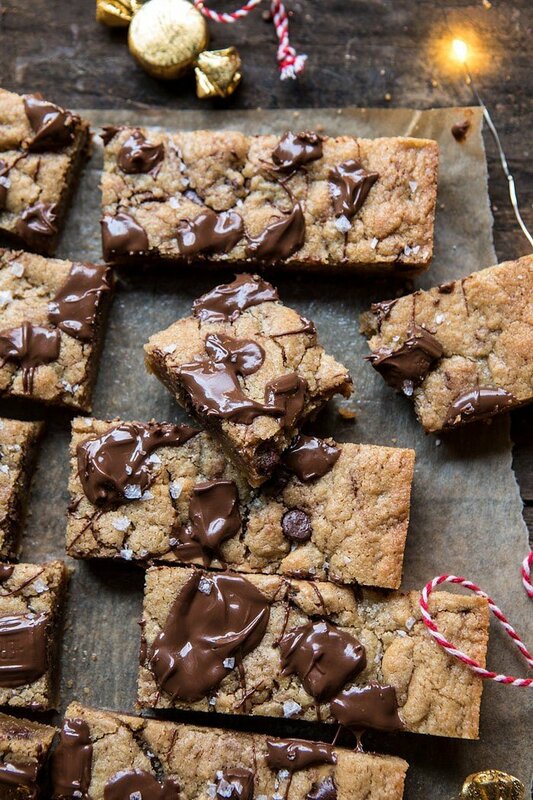 Salted Milk Chocolate and Peanut Butter Blondies. 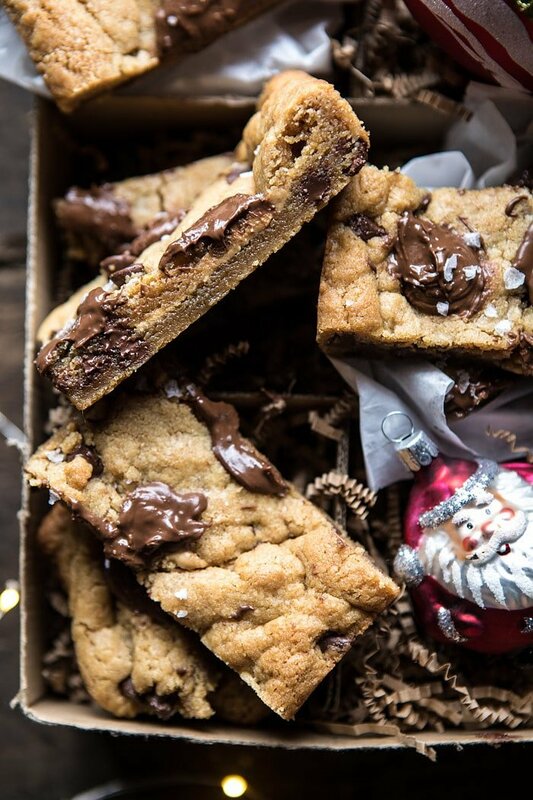 All Fridays in December need something sweet, enter these Salted Milk Chocolate and Peanut Butter Blondies. 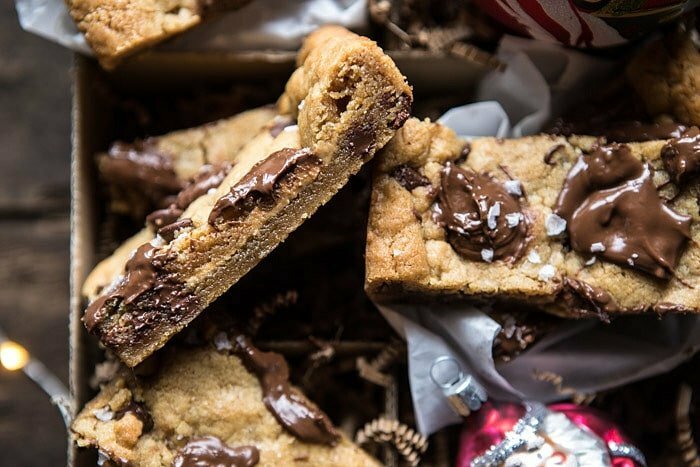 If there was ever a chocolate bar recipe to have in your back pocket, it should be these blondies. In fact, I should really be calling these Back Pocket Salted Milk Chocolate and Peanut Butter Blondies…but I’m feeling like that title might be a little on the long side. Point is, these are the best blondies I’ve ever had. 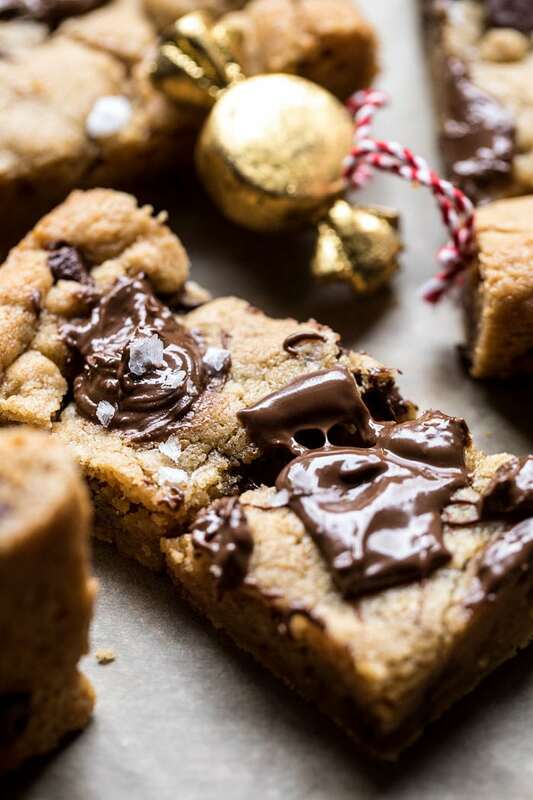 Granted, I haven’t had a lot of blondies, nor made a lot of blondies (although I do have a recipe on HBH from my very first year of blogging…the photos are scary), but still these blondies here are the best. Milk chocolate + peanut butter + flaky salt. I mean, what’s not delicious about that, you know? I mentioned yesterday that my parents have a ton of guest in town. Here’s the thing, when my parents have guests in town, that means I have guests in town too. For those of you unfamiliar, I live next door to my parent’s house, maybe a football field away from each other, and everyone who comes to visit knows two very important things, my house has the food…and the alcohol. Sometimes I really wish this was not the case, but for the most part, I don’t mind being the place that everyone comes to for good eats. My two younger brothers, Malachi and Red are currently home and with them come friends. Many friends. Red’s home for a couple snowboard competitions, and Kai is here to film both new recipe videos for the HBH Instagram and Red snowboarding…although he’s mostly been filming Red these days. Anyway…we have a lot of people around right now. The boys will be here into January and the rest of the family comes in a couple of weeks for Christmas (can’t wait to see my cousins! ), so I’m going to have plenty of mouths to feed. This means I need some really good dinners, and even more sweet treats,, for people to snack on when they come in from the cold (and let me tell you it is cold, it’s been in the single digits all week and snowing as I write this!). I decided to make these bars kind of on a whim this week, after many failed attempts at what could have been a very cute holiday cake, but I just could not get it right. After a few cakes, many sticks of butter, and a sweater covered in powdered sugar, I threw in the towel and baked these blondies instead. I needed to make something that I had confidence would be a success. Thankfully these turned out amazing, because I could not deal with another failed dessert. Again, you just can’t go wrong with anything chocolate and peanut butter. I really don’t know why this is, but it’s always the simplest recipes that I love this most. This is a one bowl, mix, and bake kind of recipe. 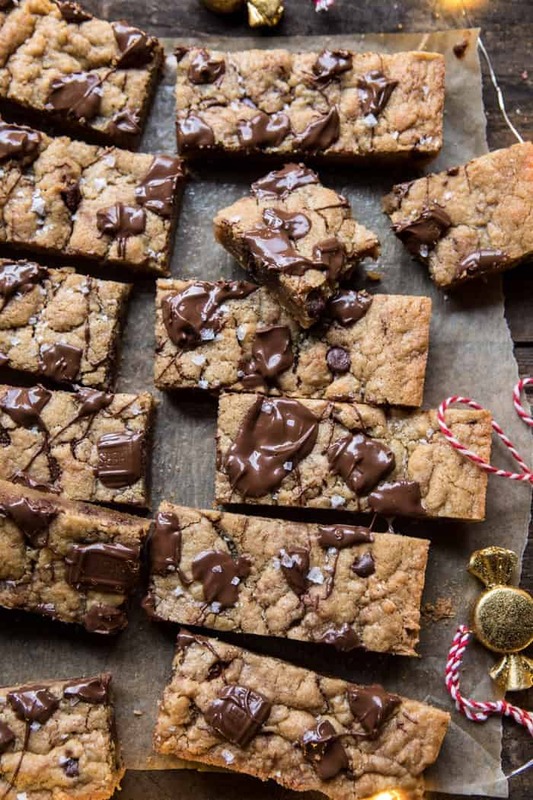 These blondies take less than an hour start to finish, and my guess is that you may even have most, if not all, of the ingredients on hand right now. The recipe starts with melted butter and creamy peanut butter. Add some brown sugar and plenty of vanilla extract. Then add flour and a handful of semi sweet chocolate chips, stir everything up in one bowl (yes stir). Seriously so easy. The key is layering the blondie dough with some additional peanut butter so you get gooey peanut butter with every bite. Then just bake. But you guys? Please, please just under bake these. Over baking them is going to ruin their deliciousness. Trust me. During the last-minute of baking you’ll add that milk chocolate and let it just slightly melt over the top of the bars. Then, add flaky sea salt. OH MY GOSH. I think I may have just described heaven in a Christmas Blondie Bar. For real. 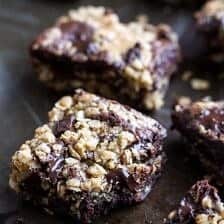 These are fudgy, peanut buttery, moist, doughy, sweet, extra chocolatey, and just a little salty. AKA the most perfect dessert. If you decide to eat these warm, I totally get that. Baked goods are better warm, no matter what any recipe says. Warm and gooey beats cold every time. PS. packing these up in a cookie box would make anyone who loves chocolate and peanut butter very very happy this holiday season. You should do it…just sayin. Start with melted butter and creamy peanut butter. Add some brown sugar and plenty of vanilla extract. Then add flour and a handful of semi sweet chocolate chips, stir everything up in one bowl (yes stir). Seriously so easy. 1. Preheat the oven to 350 degrees F. Grease a 9x13 inch baking dish. 2. In a microwave safe mixing bowl, melt together the butter and 1/2 cup peanut butter on power level high, stirring every 30 seconds until melted. Stir in the brown sugar, sugar, eggs, and vanilla. Add the flour and baking powder. Transfer the bowl to the freezer and chill 5 minutes or until the dough is no longer warm to the touch. Stir in the chocolate chips. 3. Spread 1/2 the dough out in the prepared dish. Dollop and then gently swirl the remaining 1/4 cup peanut butter into the dough. Add the remaining dough overtop, don't worry if it does not fully cover the peanut butter. Transfer to the oven and bake for 20-22 minutes, just until set in the center. Remove from the oven and sprinkle the milk chocolate over the blondies. Return to the oven for 1-2 minutes to gently melt the chocolate. Sprinkle with sea salt. Let cool and then cut into bars. Store for up to 5 days in an airtight container. Friday night plans? Blondie making and eating, while watching The Santa Clause. I love December! 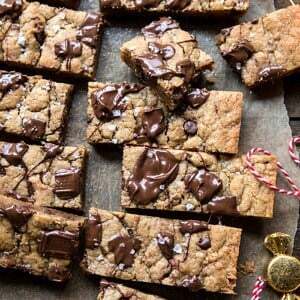 Oatmeal Chocolate Chunk Cookie Peanut Butter Swirled Brownies + Video. Thank you Liz! I hope you love these! These look INCREDIBLE! Totally delicious – looking forward to the new HBH videos too! Oh my goodness! These look so good. I am not much for peanut butter but… most all my family would go for these. Great! I hope they love these Charlotte! Thank you! YUM! Next time my boyfriend has the guys over, I’m going to whip up a batch of these! I hope you both love these! Thank you Jeanna! Do you melt the remaining 1/4 cup of butter? This is my new go-to recipe blog! I love all your amazing recipes! Could you please include directions for those of us who do not use a microwave in food prep? Thanks! I would just use a double boiler on your stovetop–boil water in a small pot, then melt the peanut butter and butter in a heatproof bowl on top. 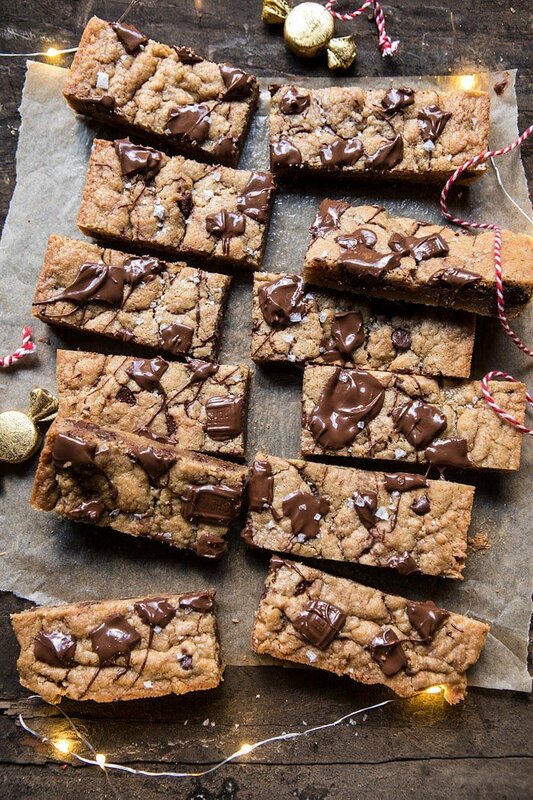 Oh wow, my son and I make blondies all the time and these take them to a whole new level. I have a stack of Hershey bars from the summer for smores that never got utilized so now they will have a place to go! 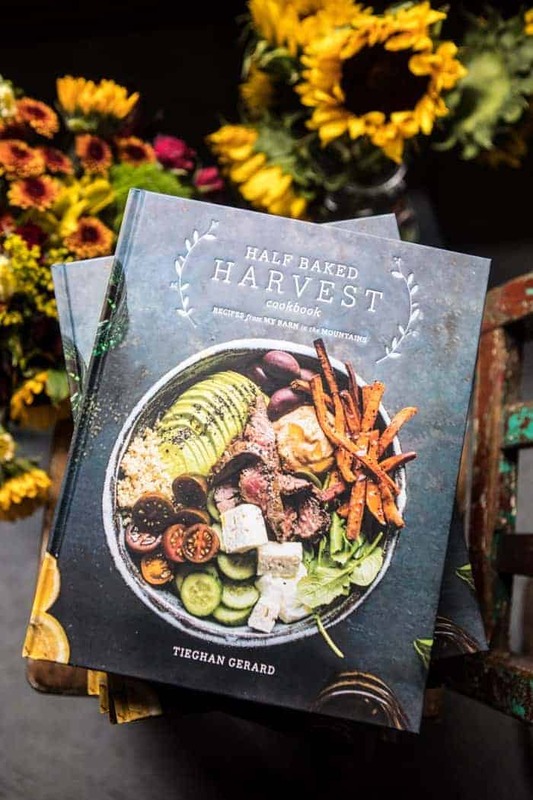 🙂 Thanks so much for the beautiful photography and wonderful recipe! Happy Holidays to you and your family. Perfect! I hope you love these ones! Thank you Elida! There’s no mention of adding the sugar! I made these today. They are fantastic. I had caramel chips and added some to the top. I loved it! Did the timing work out for you? Mine weren’t close to being done. These blondies look perfect for chocolate and peanut butter lovers and I can’t wait to bake them! I’m glad it’s finally cold in CO, and you’re enjoying seeing your brothers! Maybe you could join them snowboarding, then they can help you bake (or eat 😉). But these blondes look really nice for a warm holiday night in (with hot chocolate and Christmas movies 🤗). Maybe m&m peanut butter chips would be good, or regular peanut butter chips, too? 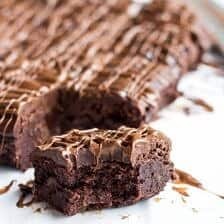 Also, I remember Alton Brown recommending to take brownies (or blondes) out of the oven half way in the cooking process, waiting 20 minutes, then letting them finish in the oven, for ooey centers! Hi! I would totally love to go snowboarding with them.. but they totally come over to eat lol!I hope you love these Kristin, thank you! 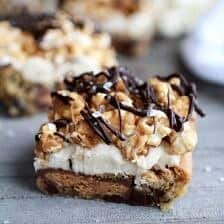 I’m planning a brownie/blondies trifle melody thing for Christmas, do you think this would work with white choc to keep it all blonde? 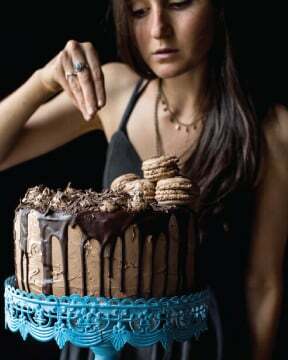 I plan a second cake layer of milk/dark choc brownies so it’ll get balanced out. 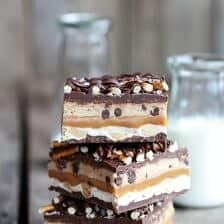 Probably some cream, caramel, and marshmallow ‘fluff’ as the layers, with some choc and caramel sauce and pretzels to top……I’m fully aware this is probably going to see us off hah!! What do you think about the white choc though? I call them decadently delish! Perfect baking project for today’s snowy day! I’ve got all the ingredients! Woohoo! Haha would love to have you there! Thank you Lindsay! These are making my mouth water! Love all the chocolate! These look to die for! Must make these immediately! I made those with powdered peanut butter to decrease the calorie count a bit—they turned out fabulously! They were a hit at my friend’s birthday party! I am so glad you liked these! Thank you Alice! I made these last night. They were amazing. Thanks so much for sharing this recipe. Great texture and flavor. I made these for a Christmas party this afternoon. I realized about an hour before we left that I wanted to bring something and happened to see your Instagram post. They were delicious!! And not very difficult to put together. I love a recipe that calls for ingredients that I typically have in my pantry. Everyone at the party loved them. Even my very picky (“I only eat vanilla ice cream”) four year old loved them! I am so glad you were able to make these and that everyone enjoyed them! Thank you Christie! Wow, these look great! I’m making these ASAP! Thank you Jennifer! I hope you love these- let me know! 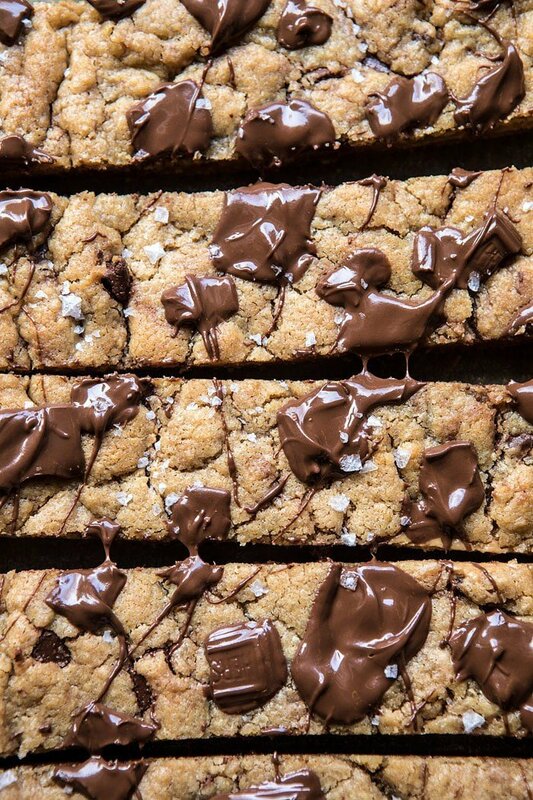 I need these blondies in my life – so good! Agreed!! I hope you love these, thanks Laura! hey tieghan! 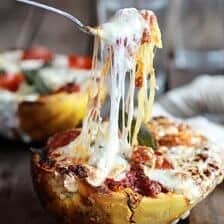 these look amazing and i’m looking to make them tonight. if i wanted to make them thicker, could i make them in a 9×9 or an 8×8 pan? or could i double the recipe and still do in a 9×13? i know this would affect baking time but would it also affect the consistency/density of the bars? thanks so much!! Tiegen, these are in the oven now. Easy and look delicious. I also added some salted caramel ships that were left over. I can’t wait to dig into them. I hope you love them! Thank you Joyce! It is starting to smell wonderful in the kitchen! Can’t wait for these to be done! I hope you love these Sandra! Thank you!! That is so great! I am really glad it worked out with the almond flour and coconut sugar! Thanks Rachel! Your dessert photos give me some serious cravings! 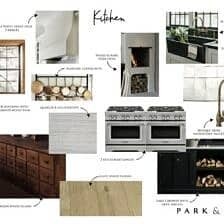 Just pinned this – will definitely be making this. Can’t wait!! Great! I hope you love these! 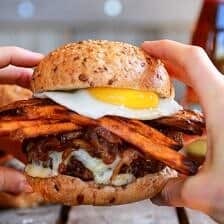 Can I use natural peanut butter in this recipe? Seriously so easy and delicious! My neighbors LOVED these! the recipe makes plenty to give in cookie boxes for my neighbors. And they turned out delicious! I love the peanut butter!!! And my neighbors love all your recipes I’ve Made. Win! Win! Will tag you on Instagram. That is so great! Thank you! I just made these and they taste very good. However, although I baked them for 22 minutes until the center was “just set” I wonder if they’re cooked enough? They are very soft and almost gooey inside…. is that just because of the peanut butter dolloped and swirled in between the layers? I even baked them another 3 minutes after I added the milk chocolate on top. Wow! These were fantastic! Made them for Christmas Eve. Thank you for the delicious recipe! I used almond butter in place of peanut butter and they were the best blondies I’ve ever had, and my family agrees! I am SO happy you loved these Lexi! Thank you + Happy Holidays! These were a BIG hit with the family this holiday! They came out perfect – moist, slightly sweet, and so incredibly yummy! I did use almond butter so everyone could enjoy them (some peanut allergies in the family). Thank you for a scrumptious blondie! Thank you Mimi! I am glad these turned out well for you and hope you had a great holiday! I’ve made these with peanut butter and with tahini. Both times were delicious. Thank you!! I am so happy to hear that! Thank you! I’ve been wanting to make these since you posted the recipe, finally had time today since it’s the holidays! They were worth waiting for, so delicious!! Chocolate, peanut butter and salt is such a perfect combo, thanks! These are amazing, and easy to make!!! Thank you Dani! I am so glad these worked out well for you! Sorry, but these bars are awful, a complete waste of good ingredients. We threw the whole pan out after tasting them. I am a fan of your food recipes, bought your cookbook. But I love to bake, and you do not know how to bake. I have tried 3 of your dessert recipes now and all 3 were awful, inedible. One was an intentionally fallen cake which is not something to strive for. PLEASE learn how to bake b4 posting more recipes. I recommend trying some Martha Stewart recipes. Dessert should be delicious! Hi Cheryl! I am so sorry these did not turn out well for you. I hope you enjoy some other recipes on my blog! Thanks! That is amazing! Thank you Jess! 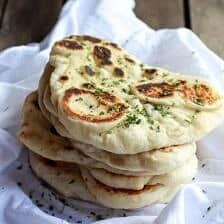 I’ve been admiring your site for a couple of days now and this was the first recipe I tried. They were so easy and so so delicious. Those salt flakes make them too addicting. Half the dish is gone already. Can’t wait to try more of your recipes! That is amazing! Thank you Sydney! I hope you love the other recipes you try! stunned why this coincidence didn’t happened earlier! I just made them, and they are excellent! All three of us loved them, they are so wholesome tasting with a big glass of cold milk. Great job, Tieghan! You hit a home run. I am so glad you loved these Tresa! And that is SO SWEET she was picking out the perfect chocolate chips! Thank you so much! May I ask a favour please..? I love trying your recipes (any & all!) but, i often wonder how well things will keep in the freezer…particularly baked goods. Especially while stocking up for the holidays, I wonder if you would consider commenting on that aspect? Thanks so much & keep up the fantastic content, your site is brilliant!! Hi Tracy! I will try to add that into the post! With most recipes, the answer will be in the comments! I hope you continue to enjoy all of my recipes! I swear I have gained at least 10 lbs since following you. And I’m OK with it 🤣! Every recipe just gets better and better!! Thank you! Hi Alina! I am so glad you have been enjoying my recipes! Thank you! Would the bars come out different if I ommit the peanut butter? I would like to make then without thanks! But it became too sweet can we control any hoe ? And this needs to be eaten how? These were delicious! Made these for a staff gathering and they were gone before lunch. Super moist and simple to make. An excellent blondie variation with the peanut butter and sea salt! Thank you so much Jenni! I am so glad you enjoyed these blondies!